Just because the valley is under feet of snow doesn’t mean you can’t take a hike. You just have to know where to go. 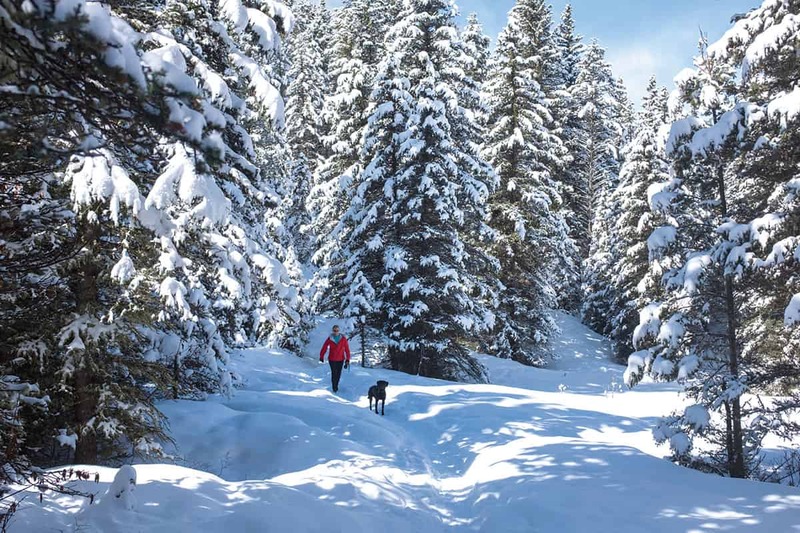 Thanks to an increase in human-powered grooming, you can hike without snowshoes or Nordic skis in the Cache Creek area. 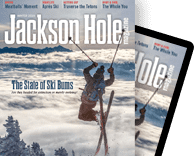 JACKSON HOLE IS known for its skiing. And snowmobiling. And, increasingly, its Nordic skiing. There are wonderful opportunities to snowshoe in Grand Teton National Park. Jackson Hole even has dog sledding, fat biking, and ice climbing. It’s just been the last couple of winters you can add hiking to that list. Yes, you can hike in Jackson Hole in winter, at least if you pick your trails carefully. I have skied, biked, hiked (in summer), and run up Cache—pronounced “cash”—Creek, a small valley in the Bridger-Teton National Forest, for nineteen years now, but it isn’t until I hike there in winter that I really pay attention to the details of the area. Only two miles from the Town Square, Cache Creek is the favorite gym of many locals, myself included. I go there to work out, not to savor the surroundings. But when hiking here in the winter, there’s no choice but to go slow. And when I slow down, I can’t help but be drawn into the scenery. FOR FIVE MINUTES now I’ve been snapping photos of hoarfrost—sometimes called “frost on steroids” because its crystals are larger and more intricate than usual frost—on the trunk of a downed tree. These flakes, between one to two inches, are huge. I’ve never seen anything like them. Their architecture is even more interesting than that of snowflakes. And, while these frost crystals will eventually melt, compared to snowflakes their lifetime is infinite—up to weeks, depending on the weather. Generally the crystals on this tree are shaped like feathers. I find one I think is the most perfectly shaped, carefully compose a photograph, and snap the shutter button. No sooner than I capture that image do I see an even more perfect feather. I must take a photo of it, too. Eventually, I move on from this tree, but within one hundred feet spot more frost crystals I want to study. These look like fangs instead of feathers. I get so close to the tree, the frost fills my entire field of vision. I smell the earthiness of the emerald green moss that also grows on the pine tree. I see a hoarfrost fang that looks like it belongs to a T. rex. Another five minutes pass, but my camera never comes out. Sometimes it’s nice to just engage with experiences like these rather than try to capture them. I’m hiking with a visiting friend, Keri. If I had traveled halfway around the world (Keri is here from New Zealand), and my friend took me on a hike and we’d been walking for thirty minutes and only covered one-quarter of a mile, I would be disappointed. Testifying a little to Keri’s positive attitude, but mostly to the frozen beauty of Cache Creek, she’s been happily face-first in hoarfrost, too. When we finally make it deeper into the valley—but still not more than one mile from the parking lot—Keri begins noticing the larger scenery. “Anywhere else this would be a national park,” she says. As I ponder this statement, we round a curve and almost come face-to-face with a moose. Since we’re at a point where a singletrack trail comes into the main trail, which we’ve been walking up, we take a different route back to the trailhead. Year-round, Cache Creek is a great area to spot wildlife. 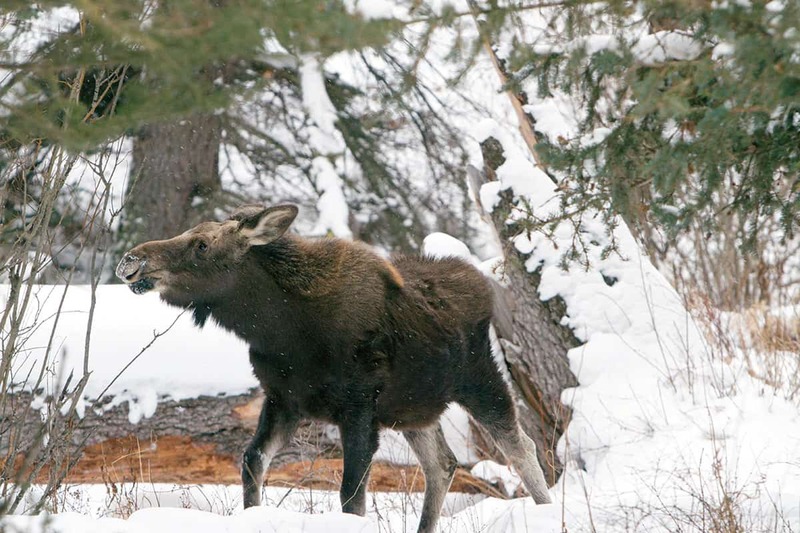 In winter, moose are the most frequently seen animals. HIKING A SHORT distance on the decommissioned road up Cache Creek in winter is not new. Thanks to grooming (for skate and Nordic skiing) by Teton County/Jackson Parks and Recreation and heavy foot traffic from area dog owners, the first bit has been hike-able for five years. What’s changing is that the first bit is getting long enough to be considered an actual hike. Keri and I go one mile up the road before running into the moose; if it wasn’t for the ungulate, we could have kept going. It’s only been a couple of years that there are any packed singletrack trails, though. It is one of these trails Keri and I jump on to return to our car. Over the last three years, fat bikers, led by David Hunger from Teton Mountain Bike Tours and avid cyclist Kris Quant, began to purposefully pack down summertime singletrack mountain biking trails. The fat bikers, whose rides have tires that are nearly four inches wide, wanted more exciting winter riding options. Last winter, Friends of Pathways (FOP) joined Hunger and Quant. The cycling advocacy group wrangled volunteers to help with grooming—it was all human-powered—and also got funds to pay some people, including Quant, to groom a few times a week. This winter, FOP is experimenting with mechanized grooming. Whether done by snowshoe or with the help of a machine, a groomed singletrack trail can almost always support a hiker as well as a fat biker. As lovely as hiking up the main Cache Creek trail is, the singletrack return trip to the car is more so. I’m usually a fan of big, wide-open spaces and vistas, but there’s something calming about winding through a forest blanketed in snow on a path that’s only one foot wide. I feel like Mother Nature is giving me a giant bear hug. There’s no doubt the trail is hugging me; the few times I step out of the packed track, my foot sinks into snow up to my knee. Learning from my mistakes, Keri makes sure to stay on the packed snow. Because she is far more coordinated than me, she has no difficulty doing this. Several days after my Cache Creek hike with Keri, her comment that the area would be a national park anywhere else sends me off on a Google search. Her sentiment might be a bit exaggerated, but Cache Creek is certainly special. I check to see if other mountain towns have a place that is as easily accessible, diverse, beautiful, and wildlife-rich as this area. I don’t find anything. I find a couple of places that come close, but exploring them requires snowshoes or cross-country skis, which, now that I’ve learned winter hiking can be a thing, I’m less excited to do. Emily’s Pond Levee Trail (“the Dike”) runs northeast along the Snake River starting from the east side of the Wilson Bridge. It does not feel as wild as Cache Creek, but does allow for a five-mile (round-trip) hike all winter long. (Because this is an out-and-back hike, you can turn around at any point.) This hike starts at the Emily Stevens Trailhead off Wyoming Highway 22. On it, you’re sandwiched between the Snake River and giant cottonwood trees, so the scenery is pretty spectacular. Like Cache Creek, this spot is popular with moose. Unlike Cache Creek, the dike is completely flat.